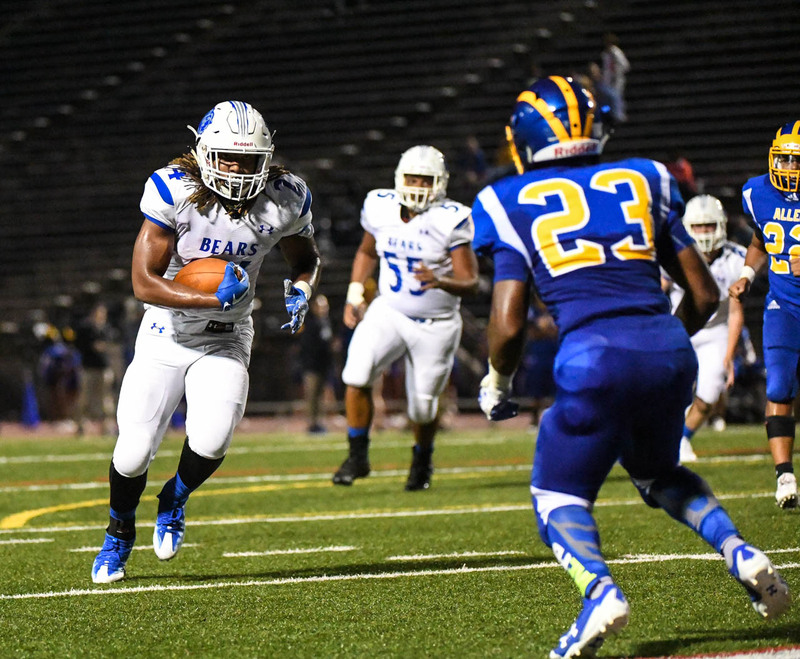 The Pleasant Valley Bears traveled to Allentown for a matchup against Allen High School on a cloudy and damp Friday night. The lights shone on the field, the bands were playing, and the atmosphere was definitely Friday Night Football! Allen started early and scored a touchdown. 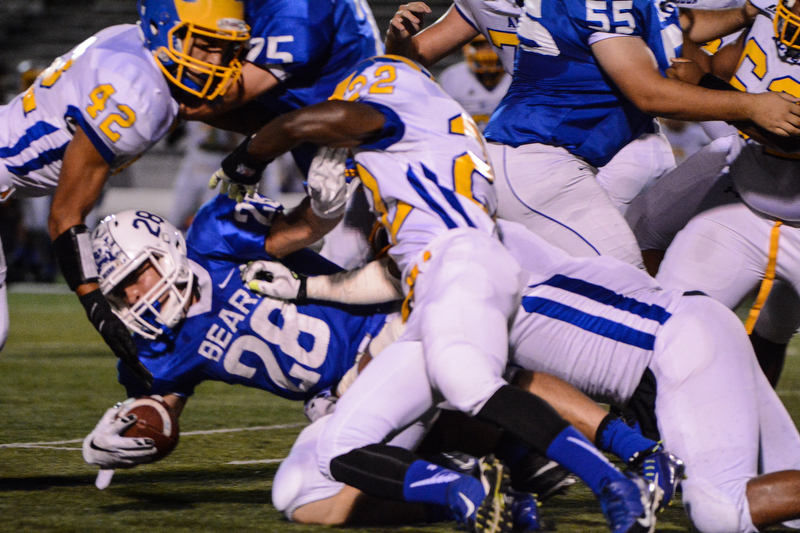 The Bears kept fighting and running the ball against the Canaries’ defense. 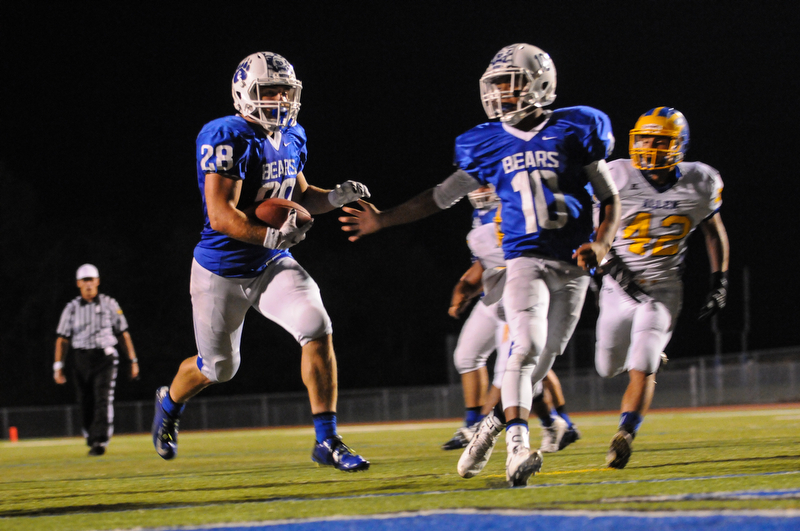 Some mistakes and penalties took their toll, but the Bears kept fighting and running. The score at halftime was 13-7 in favor of the Canaries. Allen received the second-half kickoff because of their deferment at the coin toss before the game began. They marched down the field on the opening series of the second-half and, with the help of a pass interference penalty, scored a touchdown again. 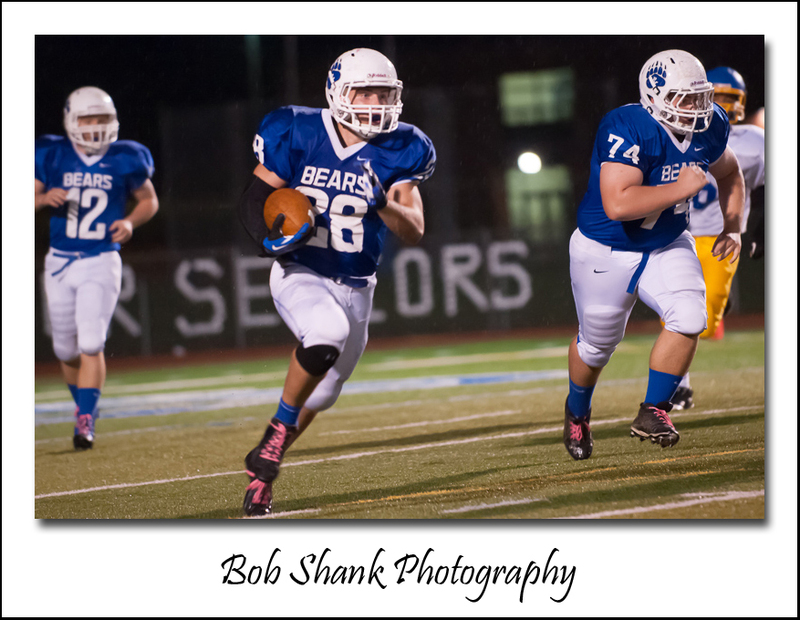 The Bears did not give up and with time winding down, scored another touchdown at the end of the game. The final was: Bears 14, Canaries 33. Austyn Borre had a big night for Pleasant Valley as they faced off with William Allen. Both teams entered the game looking for their first win of the season. PV’s schedule was incredibly tough in those first three games and the team played well at times but not enough to secure a victory. Tonight was different. 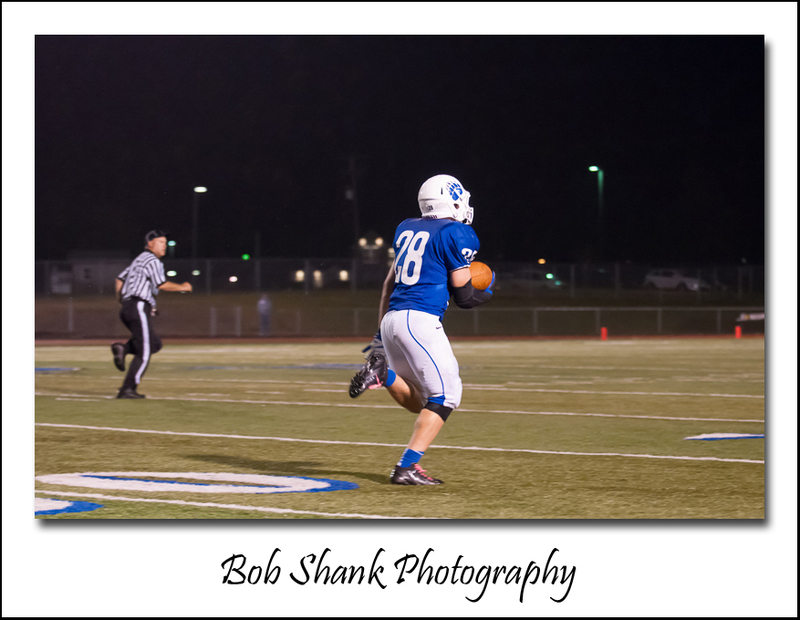 Borre had three big pass receptions and ran wild all over the field. 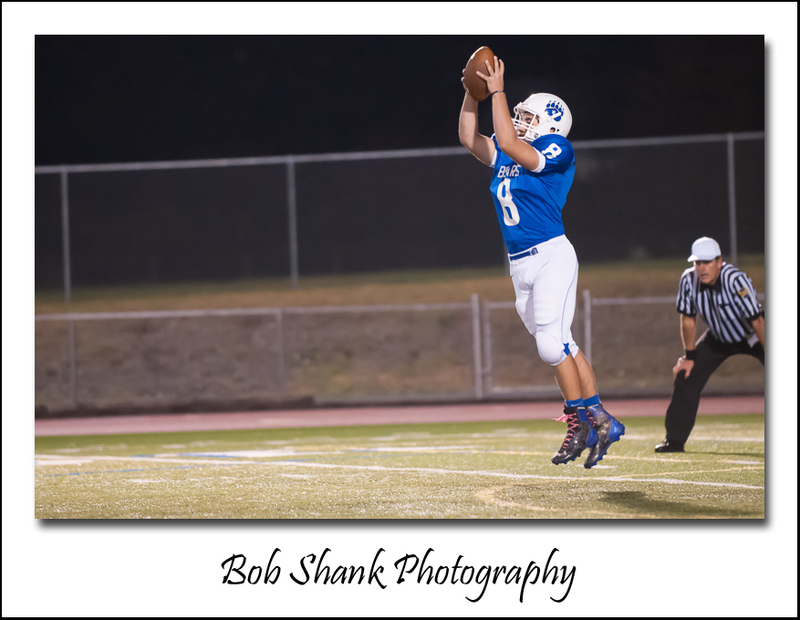 He even had a blocked punt that he recovered for another touchdown! 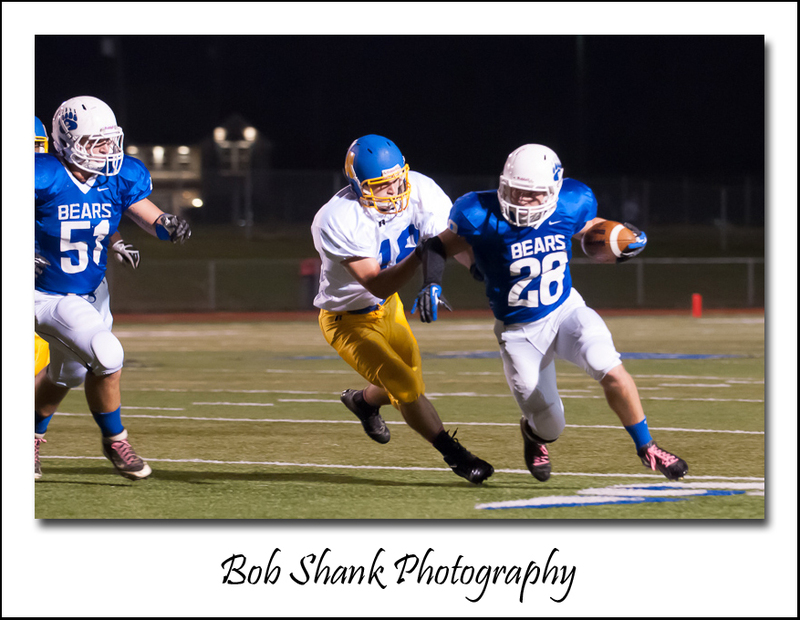 At times he ran down the open field but there were other times when he gained tough yardage. PV and Austyn Borre were about to have a big night. It was a just a matter of time. I believe Borre is going to have another big night very soon! Pleasant Valley was looking for their first win of the season. Once they won the coin toss and elected to receive the opening kickoff, it didn’t take long. 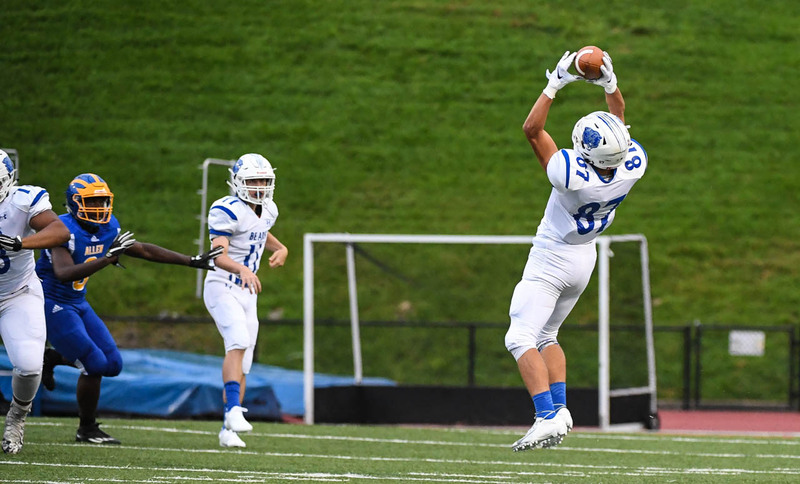 Brandon Kuehner (14) dropped back to pass on the first offensive play of the game and threw to Kevin Cruz, who turned the completion into a touchdown! PV never looked back. They scored and they scored often–on offense and special teams. It was a victory on many levels. 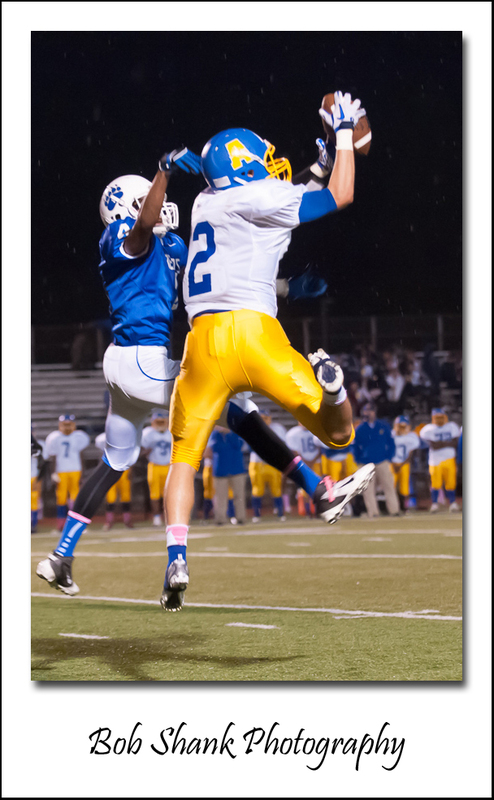 Two of my photographs of the game and a photo gallery are featured in the Saturday edition of The Pocono Record. I also posted a photo gallery of last night’s game here. Amir Blair sings his school’s Alma Mater in pre-game ceremonies this past Friday night as Pocono Mountain West hosted Allen in High School football. The pre-game activities build to a crescendo as both teams prepare to do battle on the gridiron. Bands play fight songs, fans gather into the bleachers, and the players get wound up for battle! There is nothing quite like this pre-game experience! 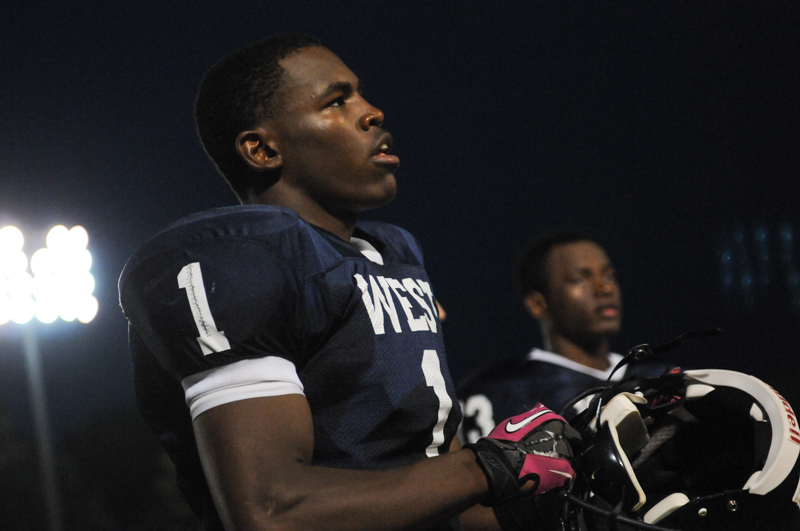 Photographing the quarterbacks in a football game is imperative. One of them, after all, could have a banner day or make the play of the game. Some recurring problems exist, however, in trying to get good photographs of each QB. Bleachers, lights posts, and vehicles in the background are distracting features that need to be avoided at all costs. Separating the subject from the background is necessary but is sometimes difficult. This is especially true for wildlife photography because the subjects often blend into their backgrounds to keep them safe from predators. The same is somewhat true for QBs: they can blend into distracting backgrounds as their predators(opponents) try to sack them! Shooting wide open with a large f-stop (small number) is a good first step in separating a subject from its background. What happens is the focus is one the subject but the background is blurred out of focus. The depth of field is shallow in this case and helps in separating the subject from its background. Additionally, other players or referees can move between the QB and our camera. Keeping the QB separated from his opponents is not only the task of the linemen, but it is also the task of the sports photographer. My approach is to take some time during each game to focus entirely on the QB. Sometimes it works well and sometimes, well, I struggle. Lack of good light or distracting and overpowering light can lead to problems as well. Focus on the subject and photograph the QB. This approach can tell an important part of the game’s story. 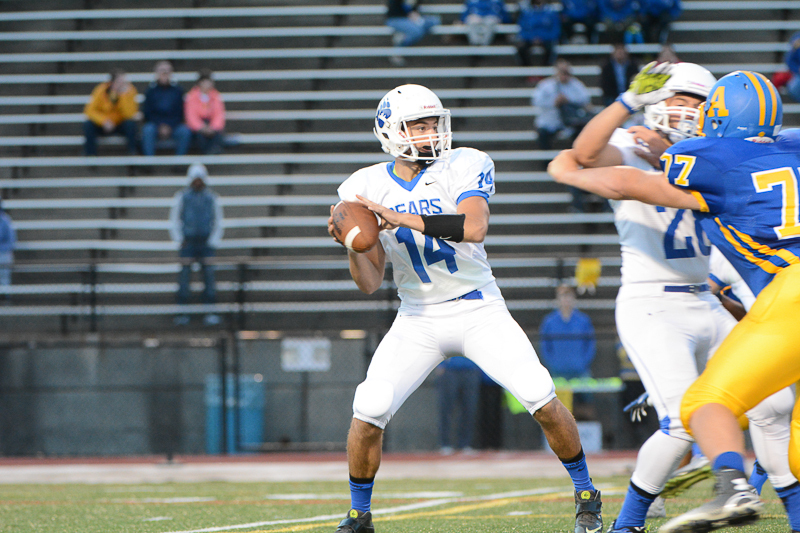 Give it a try: focus on the quarterback! This photograph was deemed worthy for publication in Saturday’s edition of the Pocono Record. 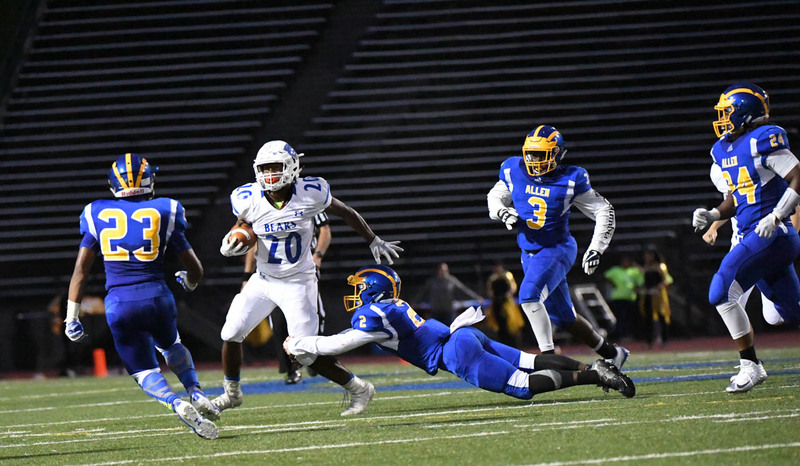 A few of my photographs from Friday night’s high school football game featuring Allen v. Pocono Mountain West appeared online today. You can see the short photo gallery here. There isn’t quite anything like the atmosphere of Friday night in the fall. Get to a game and feel the excitement! Pleasant Valley Wins Over Allen High School in a Character Builder! It took two nights, eight innings, and a come from behind rally to win, but Pleasant Valley won a character building game on Friday night! Howie Stevens took the mound in a suspended game due to darkness the previous night. Allen had rallied from being three runs behind to tie the game in the top of the seventh inning. The game was called due to darkness with runners on 1st and 2nd and no outs. This situation was inherited by Stevens to re-start the game on Friday. 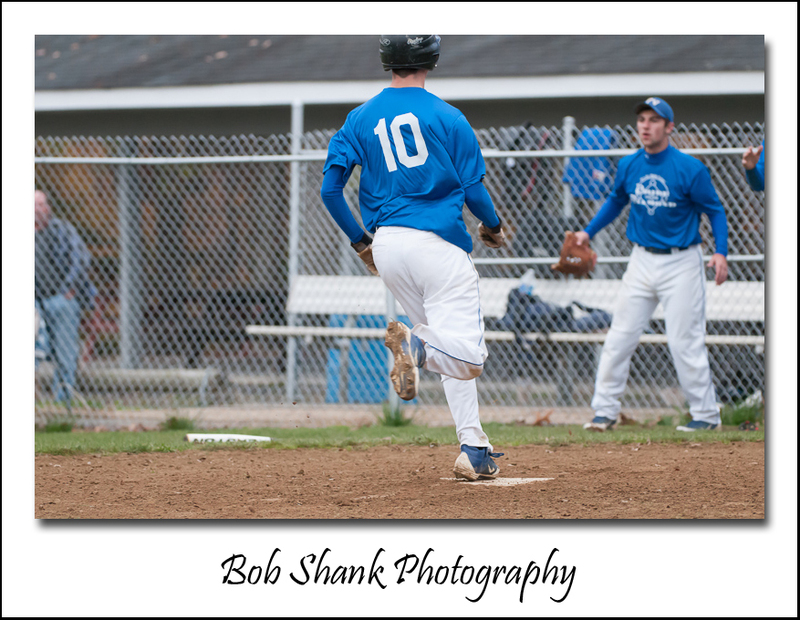 The first batter battled in the count and then drove a ground ball down the 3B line. PV’s Travis Van Houten made the play at the line and threw a bullet to first basemen, Chris Burke, to record the first out. A walk in the inning and an errant pick-off attempt, left a runner at 2B. A stolen base and another error scored the first run of the evening, but it wouldn’t be the last. 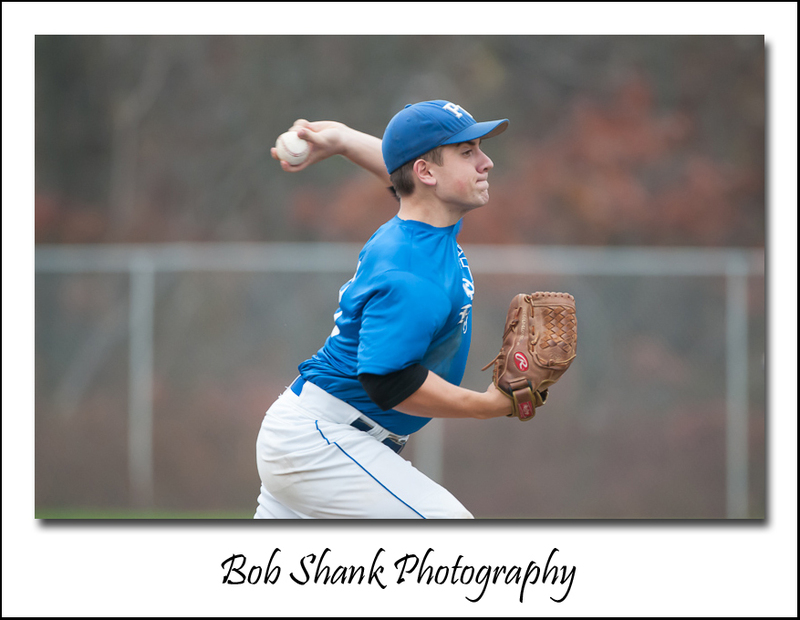 Stevens got out of the inning with good stuff and then it was PV’s turn to bat in the bottom of the seventh inning. A walk to Connor Cardenas, started the inning. Cardenas was then awarded 2B when a pickoff attempt went past the first basemen, who then interfered with Cardenas. Cardenas was then awarded 2B. Adam Raseley lined out to center field, which brought catcher, James Shank to the plate. After three straight fastballs, the count was even at 1-2. 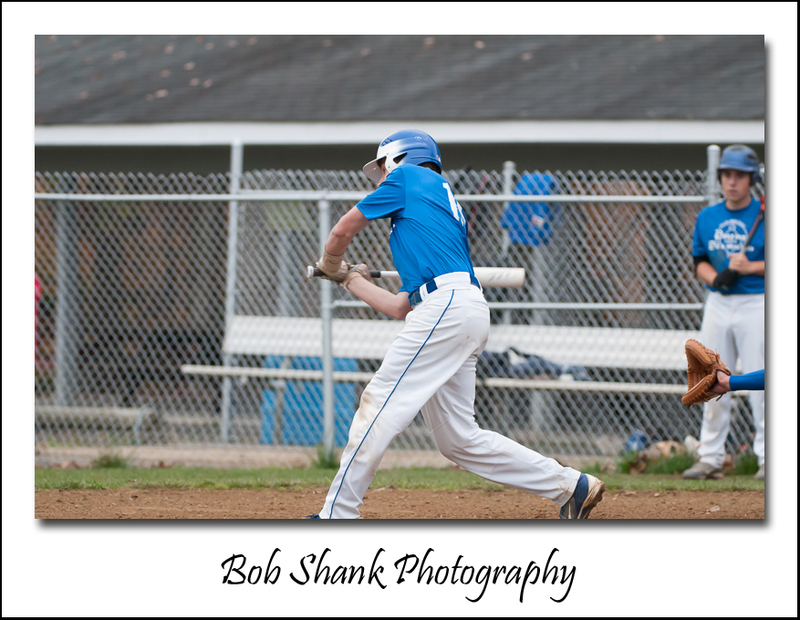 Then Shank crushed a ball over the left fielder’s head to get the game-tying RBI and send the game into extra innings! 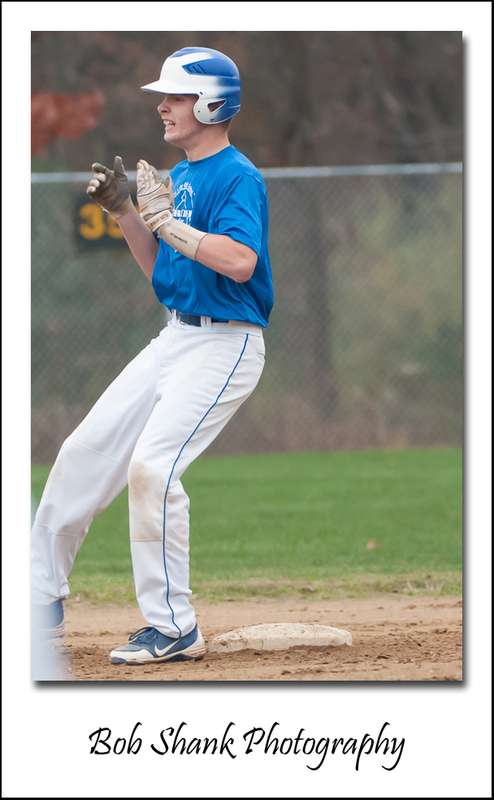 Here Shank is celebrating as he coasted into 2B with a stand-up double. Stevens again took the mound to start the top of the eighth inning. He rolled through the inning with only one walk. That runner stole second base and then got to third base. 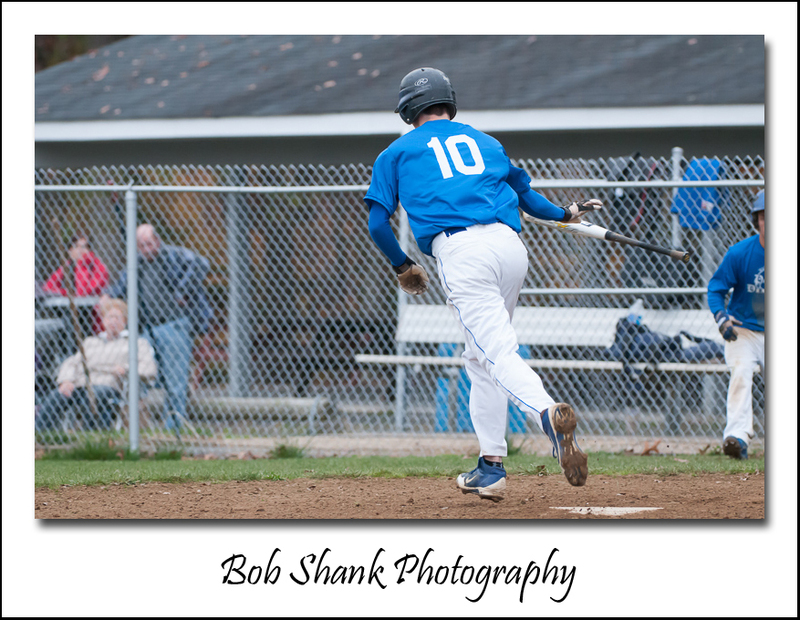 With two outs the Allen batter laid down a bunt to first base. The runner on 3B broke for the plate and 1B Chris Burke fired home. Shank put the tag on the sliding base runner for the final out! Chris Burke was walked on four pitches to start the bottom of the eighth inning for PV. Cardenas was hit by a pitch, so there were runners at 2B and 1B when Shank came to the plate again. 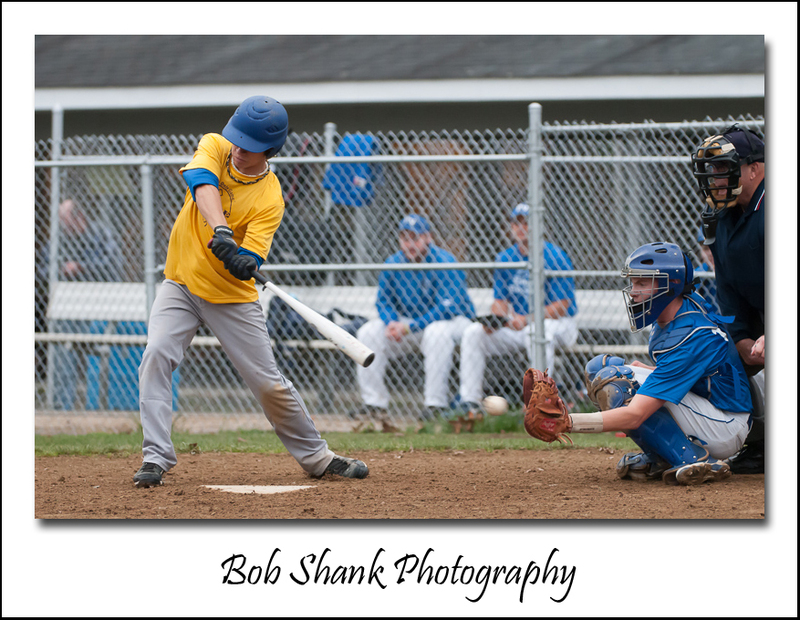 Shank’s first swing was a bullet down the third base line, but foul. 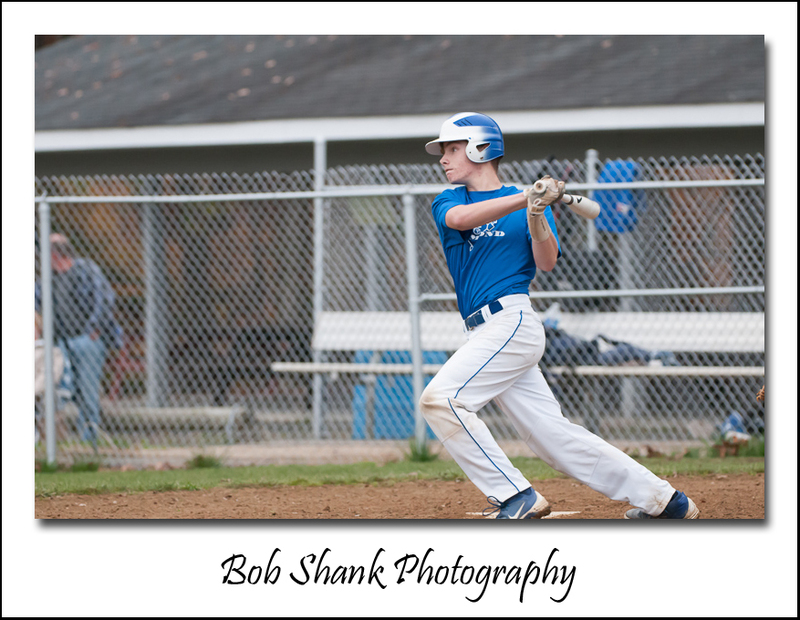 Then, with another crack of the bat, Shank hit a walk-off, game winning RBI single. 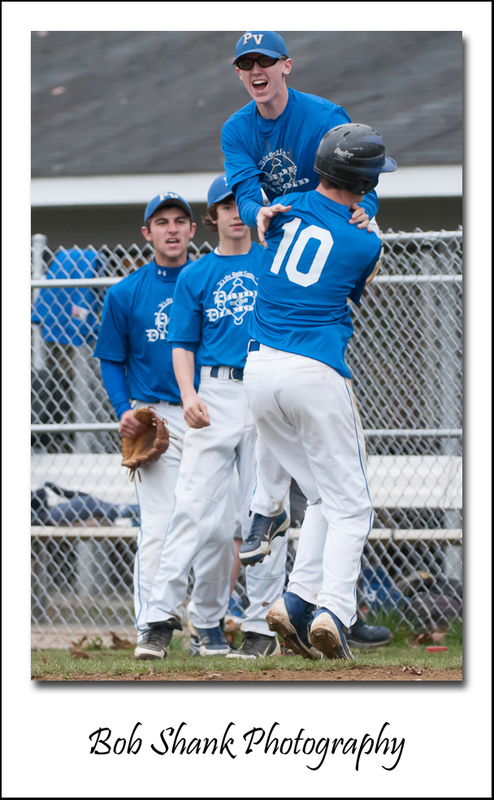 Burke scored the winning run and was mobbed by his teammates after crossing home plate. Games like this can be nerve-racking, but they build character in a team. These players stuck together and overcame the obstacles to win the victory. It’s not always easy, but winning games in this fashion build character that can take a team to many more victories. Go Bears! To see all the photos of this game, click here. 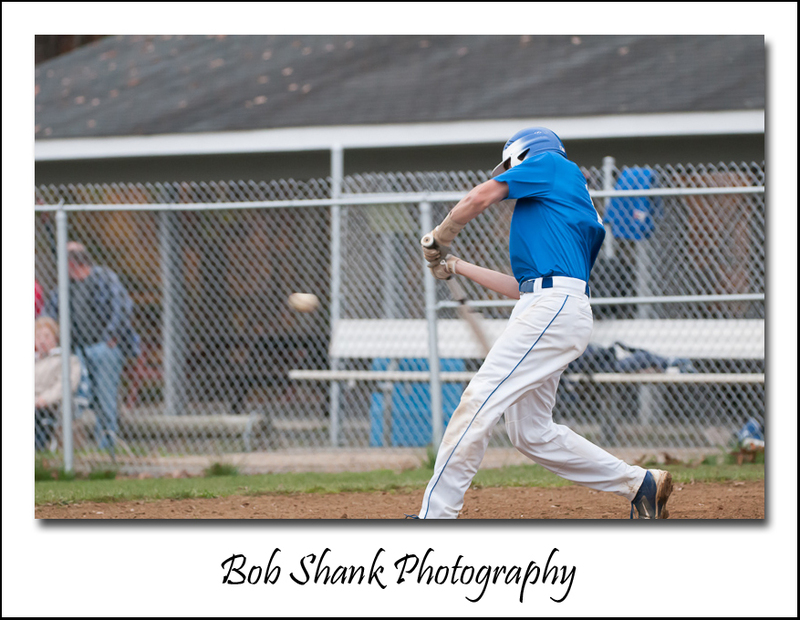 Some of my favorite sports photographs include the ball in the action! It is exciting to pony up to the challenge of capturing these shots and while it might take a great deal of effort and good timing, the success is rewarding! I always believe that every game has a story to tell and part of our job as photographers is to capture and tell the story through our lenses. I will take this even one step further: each and every play also has a story to tell! Think about it… a quarterback drops back to attempt a pass, the line is fighting off the pass rush and maybe even a corner blitz, the receivers are running their routes, and the defensive backs are defending their territories. Isn’t there a fascinating storyline in here? One of the best ways I find to tell the story of a play is to include the ball in the image. Not only does this help tell a specific detail about the play, but it adds action to the photograph like nothing else can accomplish. All eyes are on the ball–both in the field and in the image! Now this might sound easy, but nothing could be farther from the truth. Just try to capture a sharp image of a moving ball on a Friday night under the lights! The challenge is still worth the effort, however. 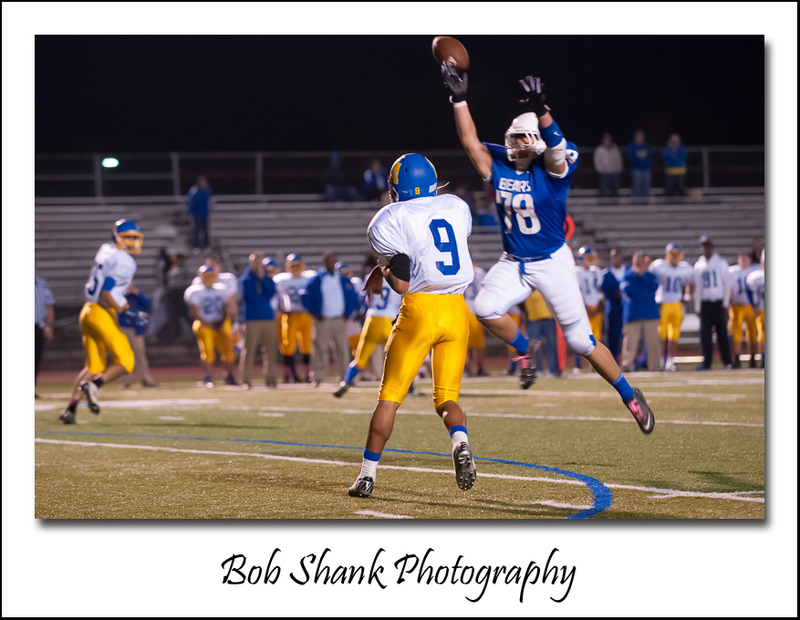 That’s why you will see me along the sidelines week after week trying to get to capture the ball in the action! 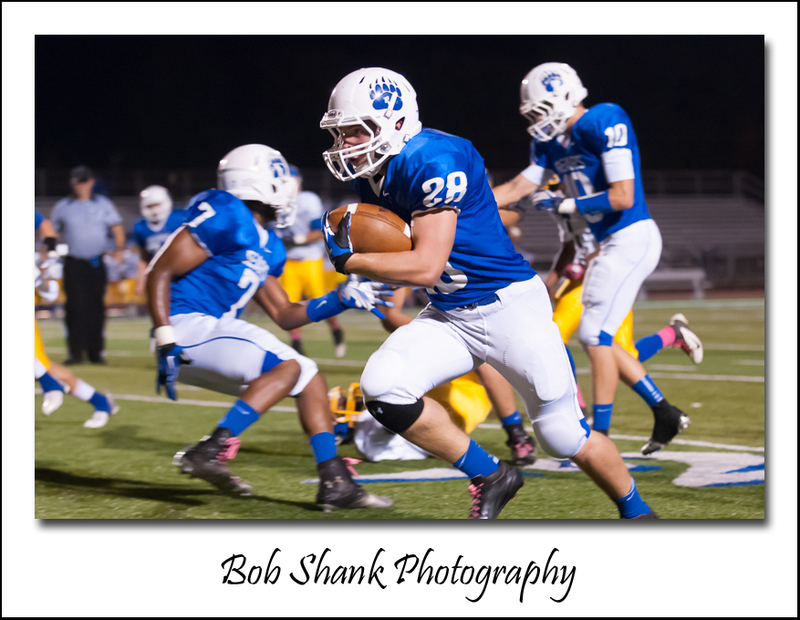 It was a big night for #28, Austyn Borre, on Friday. Borre broke the Pleasant Valley rushing record for the season as he hit 1,083 yards by the end of the game against Allen. Rain fell on the field at times, but it certainly did not rain on Austyn’s parade! The running back’s banner night started with some impressively strong runs. He put together one hard, fast run after another and found the end zone a total of four times! In addition to quick moves and strong runs, Borre found the seams made my his offensive linemen and quickly darted through them to add to his yardage. 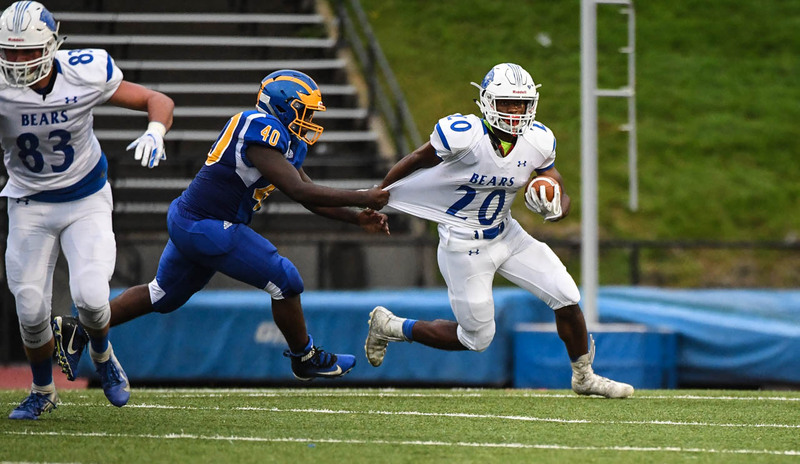 It was a clinic for running backs and propelled the Bears to huge victory to remain undefeated in the Mountain Valley Conference. 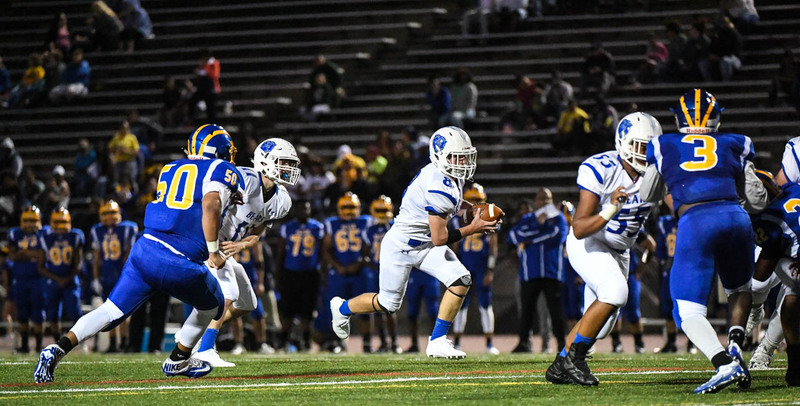 The run which broke the season record was an impressive 91 yard run where broke away from defenders in a flash going untouched into the end zone. 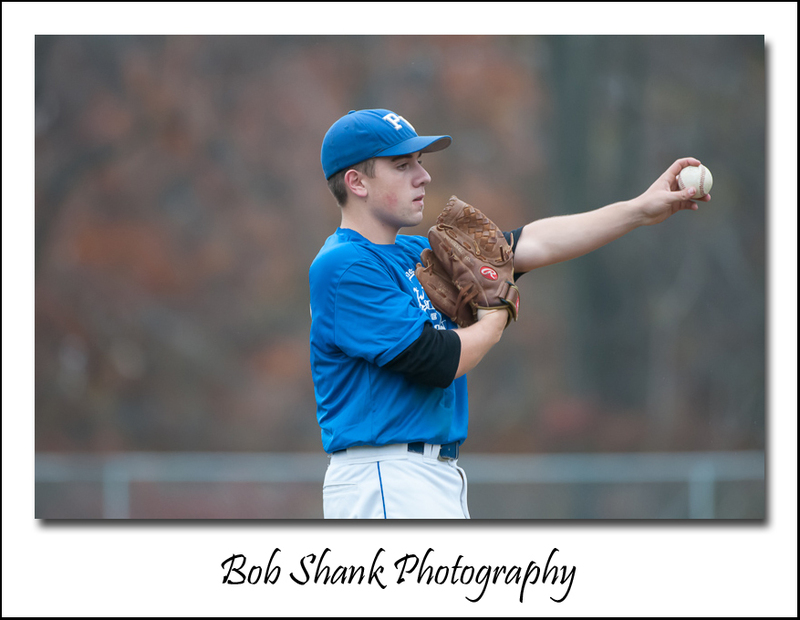 The previous school season record was 1,081 held by Rob Getz who now plays at Widener. Borre is a freshman and brings with him a lot of running back power toward PV’s current season run for the MVC Championship. He also brings much promise for the next three years! Pleasant Valley kept the pressure on Allen all evening and Borre kept running and adding up yard after yard. The final score was 42-0. 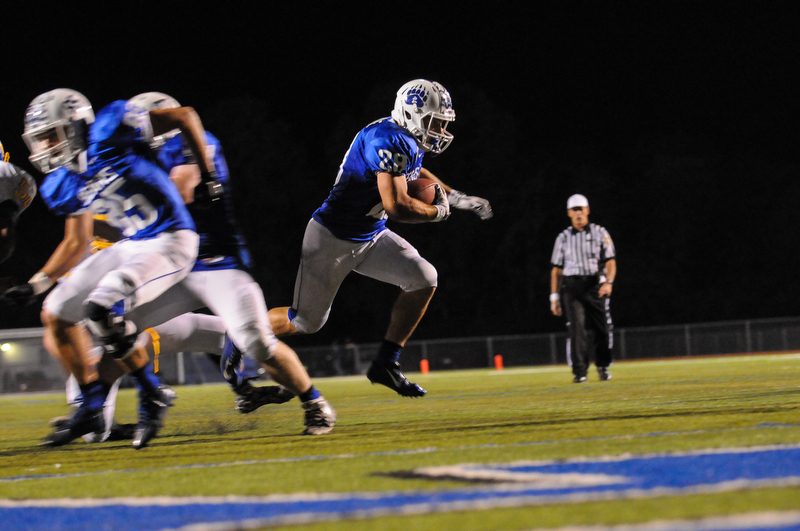 He ran the ball 14 times for a total of 185 yards, which averaged 13.2 yards per carry. Not bad for a freshman who is definitely making an impact for the Bears when they face their opponents. 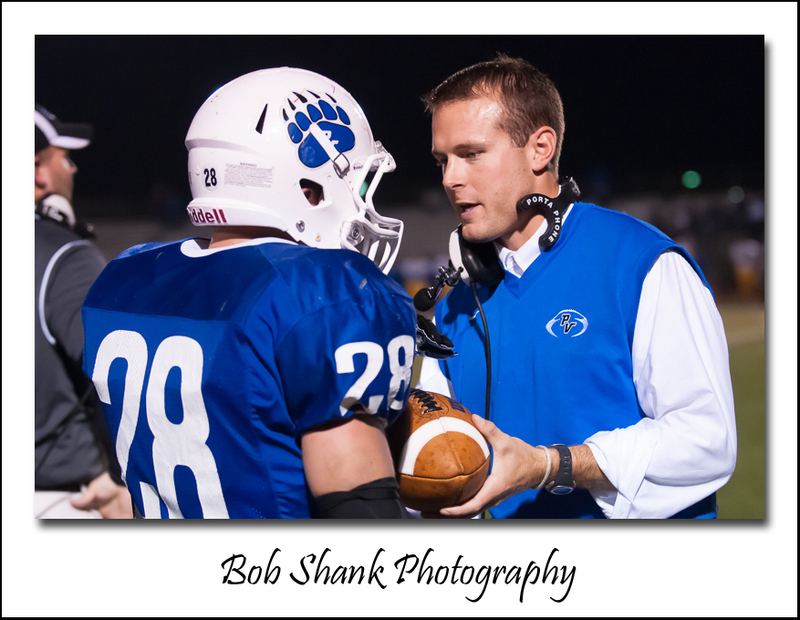 Coach Terwilliger must be very happy to have such a weapon on his offense as the team comes down the final stretch for the MVC Championship. 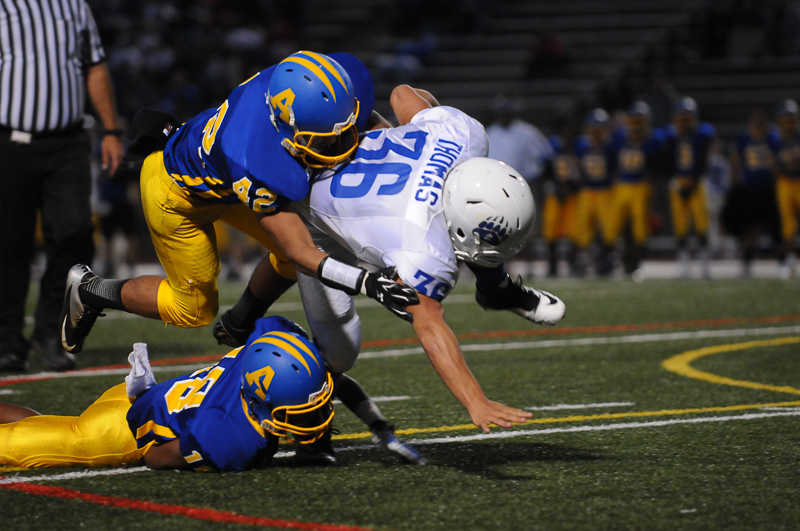 Two upcoming games against East Stroudsburg North and Stroudsburg will cap the season and determine the champion. Photographing this game was a great experience for me as I tried to highlight the rushing record and tell the story of the game. 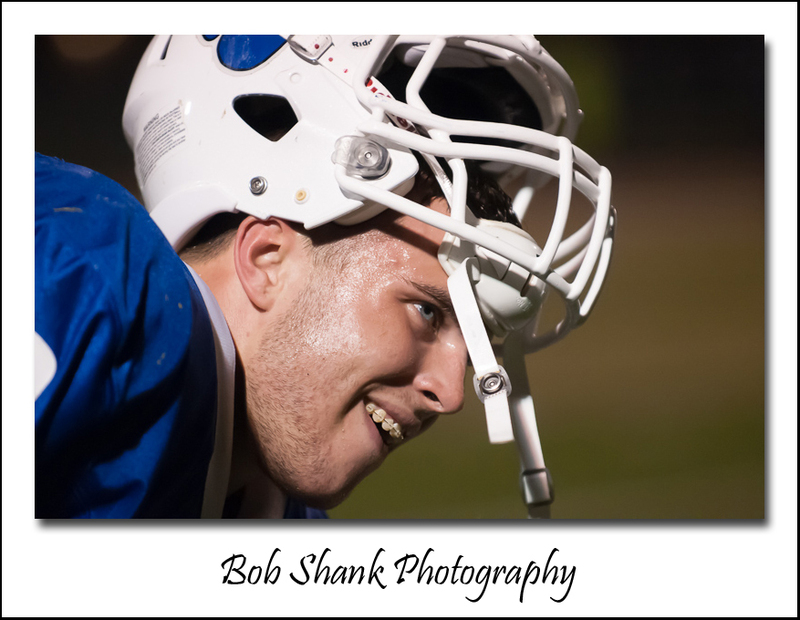 Photographing a high school football game under the lights can be a real challenge to say the least. 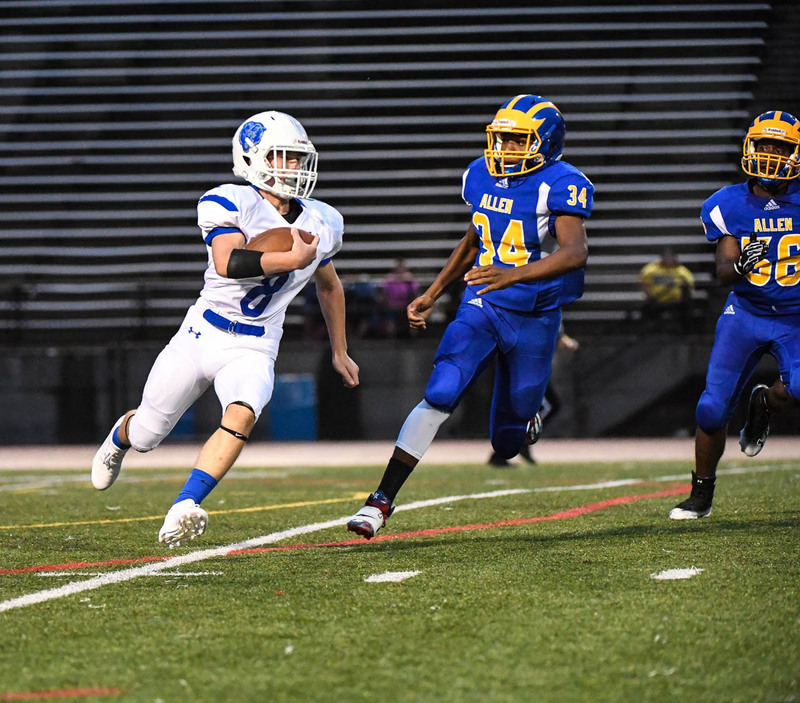 However, great subjects like Austyn Borre with his incredible running talent and Coach Terwilliger’s passion for football and his players makes it all so much easier by creating great subject matter! Part of the problem with night games is the lack of light for our cameras. High ISOs and fast shutter speeds are the name of the game for sports photographers at these venues. 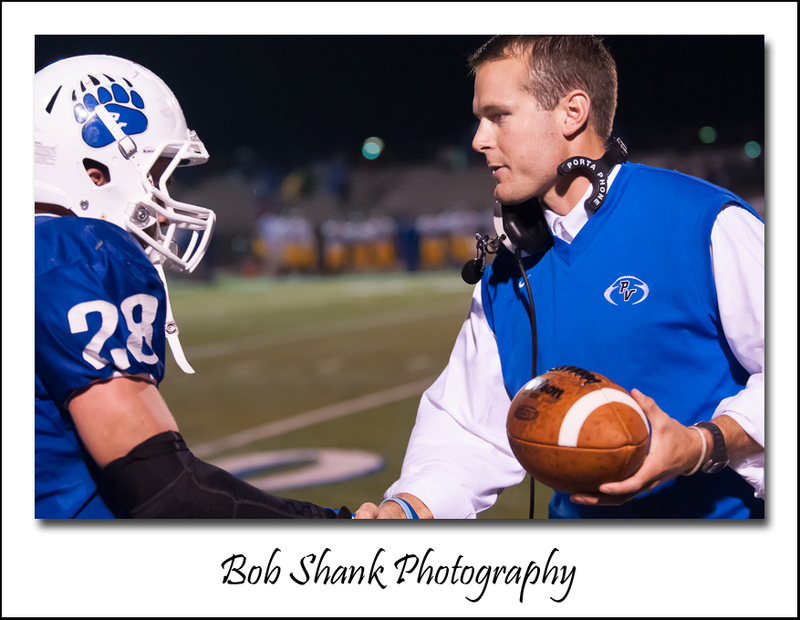 The falling rain added to the challenge, but photographing the record-breaking run and the coach handing the game ball to Borre made this an historic game within the game! Fans were treated to a big win and a season high rushing record to boot! Now who wouldn’t want to photograph that? 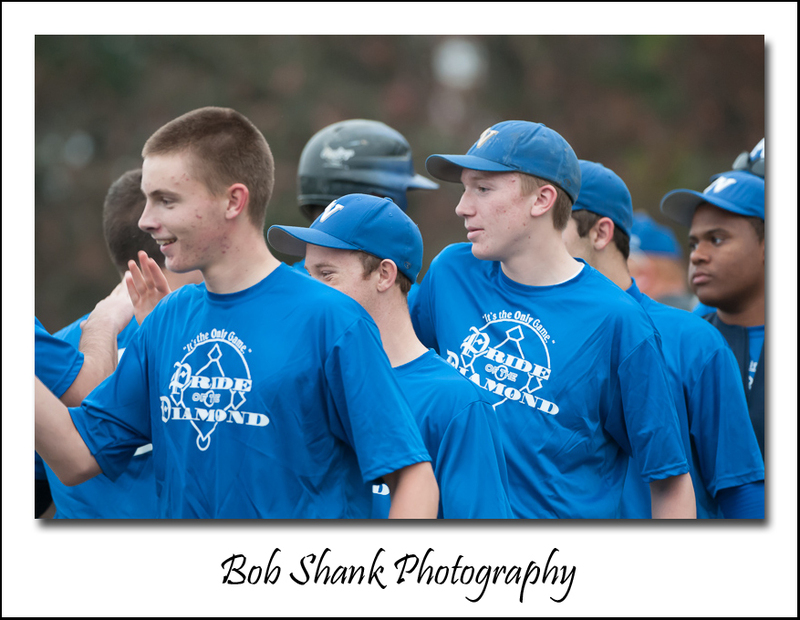 To view all the photographs from this game, click here.